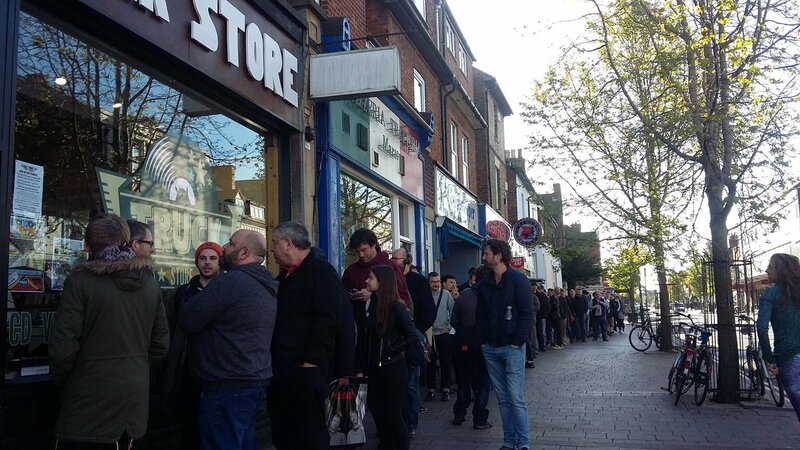 As the day progressed and the queue got bigger we went into Record Store Day frenzy and had our busiest ever day! Into the afternoon we welcomed DJ’s Count Skylarkin, Tiger Mendoza, Charlie Livingston and our very own Carlos (the one-day-only comeback of DJ Reasonable!) onto the decks. Sunday saw a somewhat shellshocked staff-force re-build the store in time for live sets from the delectable Vienna Ditto and the dreamy Kid Kin, both of whom sounded as good as they did thanks to the skills of Ian De Quadros, thanks Ian! As if that wasn’t enough fun and games, Monday 24th saw the mighty Maximo Park hit the store for an intimate acoustic gig. With over 70 people in the shop Paul Smith and Duncan Lloyd of the band played tracks from the new album ‘Risk to Exist’ as-well as some old favourites. We sold out of many of the titles this year however we still have some Record Store Day titles available. We have managed to get a few restocks in from the record companies as-well as transferring titles between our 2 stores.